Bittersweet vine engulfing a tree. How and why I make Bittersweet Art. For the last decade I have been developing an art form that focuses on the use of an invasive species, a vine popularly known as bittersweet. It was introduced into the United States around 1860 as an ornamental plant. The plants grow close to trees, which they climb, wrapping tightly around the trunks. The image is beautiful, but with time the vines grow up and over the tree outcompeting it for sunlight. Eventually the tree dies. In working with bittersweet I accomplish three goals. 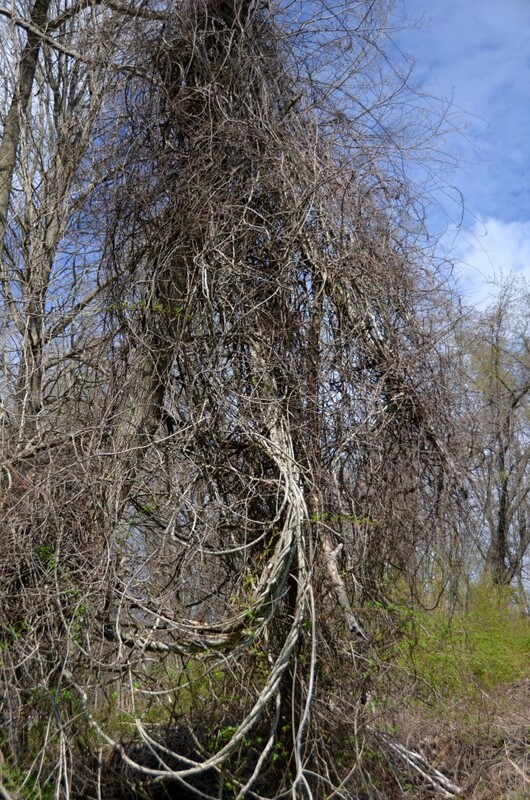 By removing invasive vines from trees, I am saving the trees from certain destruction. I am using material from nature in a unique way, crafting furniture from material that would otherwise be left to decompose. I am also creating eco-friendly furniture (come now call this “green” furniture) that does not in any way harm our forests. After being cut, bittersweet remains pliable for about two weeks. This is the time window I have to work intensely with the vines, matching and shaping them to become the particular object I envision. After I have “woven” my piece of vine furniture or vine art, I let it dry for about one month. Then I apply one coat of epoxy to protect it from the weather. Finally, I apply three coat of marine spar varnish which gives a lovely sheen. I typically use blue stone or granite for tabletops and bench seats. I select each piece from a stone yard, paying great attention to the topography and color variations of the stone. I seal each stone to protect form spills and scratches. My furniture brings nature into your home. My pieces both calm the soul and excite the imagination. Each is truly one of a kind, a collaboration of a woman with the natural world. This furniture is a creative interpretation of adirondack furniture or twig furniture. It’s a modern type of rustic furniture but has a more sophisticated style and feel.